Oracle patch set 12.0.1.2 has been released and with it comes an important new feature: the In-Memory option. CERN has been involved in the testing of this feature since an early stage so I'd like to take the occasion to share my experience with you! My SGA target was set to 186G, before assinging memory to the IMC store the default buffer cache was using the bulk of the SGA memory: 169 GB. After giving 100G to the IMC store the buffer cache was left with 69 GB. Ofcourse the memory used by the new column store has to come from somewhere! One of the performance challenges when using the new In-Memory option will be to decide how to use the memory available in your system. Keep in mind that OLTP workloads work best with row-based storage and benefit from data stored in the buffer cache, while the columnar store will help to optimize analytics-type workloads. Once the inmemory_area is defined, we need to indicate which tables are candidates to be stored in the IMC store, using ALTER TABLE ... INMEMORY. Some work will have to be done to transform the row-storage into the columnar format. Whenever the In-Memory population is triggered the background-workers spring to live. IM population start after the first full scan of the table or at instance startup for CRITICAL tables. 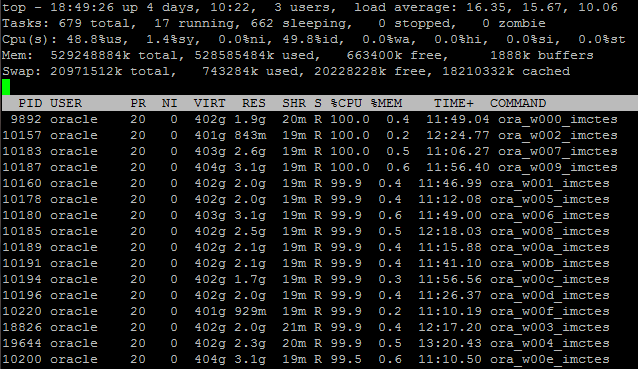 The default number of IM background-workers is 1/2*CPU-cores. While the IM population is in progress, the database remains available for running queries, but you won't see the full benefit of reading your table-data from the IMC store until the population is complete. And you will see "% of bytes in-memory" growing as the table population is progressing. The "electron"-table contains a mixture of floats, doubles and integers used to describe electron-particles recorded by the experiment. The "Event Filter"-table contains booleans stating whether or not a set of conditions was passed (most of the booleans are "false"). The "Missing Energy"-table contains only floats and doubles, all of which describe energy-values that are unique for each measurement, here the compression rate is the lowest. As expected the compression rate strongly depends on the data that you are storing, but a clear benefit of the IM store is that you will be able to fit more data in memory than you could using the buffer cache. This query executes 40 times faster when reading data from the In-Memory Column Store compared to reading the same data from the buffer cache. The improved performance illustrates the advantage of using columnar storage, I could directly access the 2 columns used in the predicate filtering rather than extracting the relevant column from the blocks using the row-based storage. This query executes around 7x times faster using data stored in the IMC store rather than the buffer cache! That big peak around INV_MASS=90. is caused by electron-positron pairs being produced by the decay of the Z0-boson, one of the two elementary particles that mediates the weak interaction. Since you're reading the CERN database-blog I hope you also enjoy learning something about particle physics! 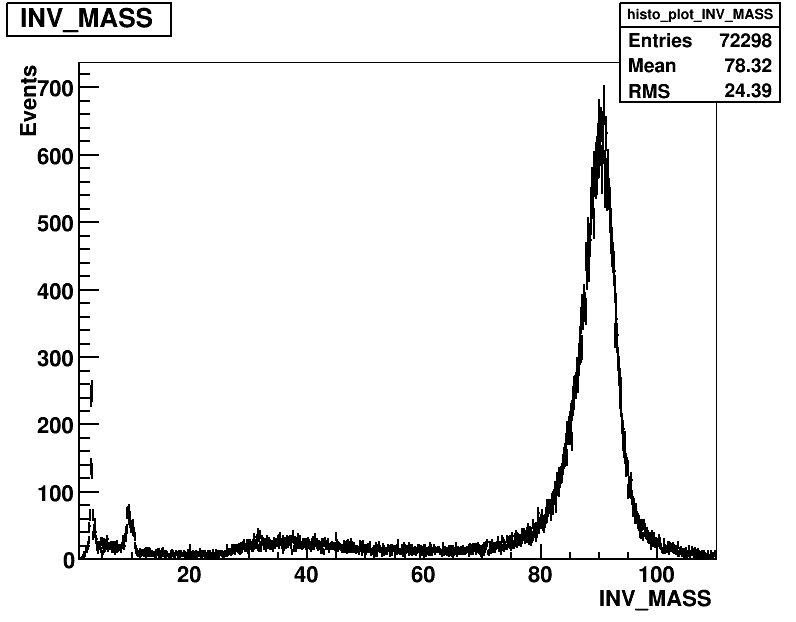 PS Curious about those peaks at the beginning, around INV_MASS=3. and INV_MASS=10. ?